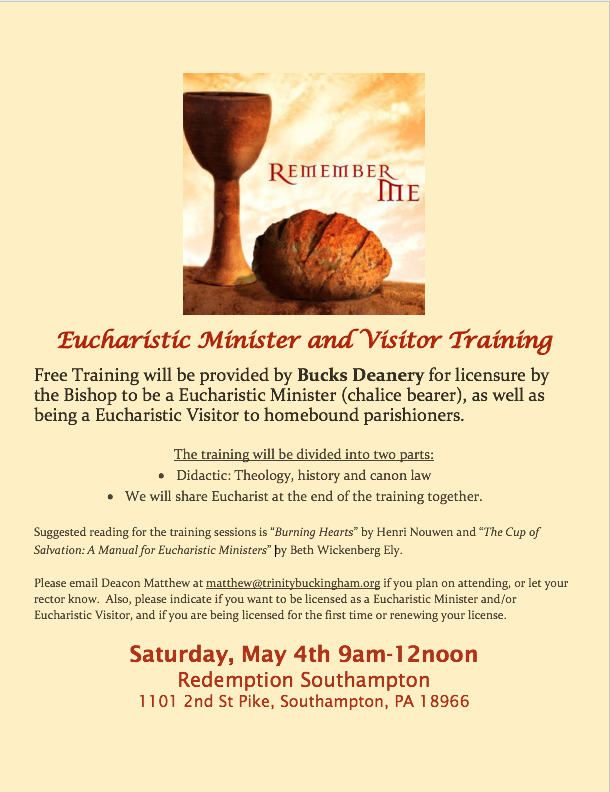 Free Training will be provided by Bucks Deanery for licensure by the Bishop to be a Eucharistic Minister (chalice bearer), as well as being a Eucharistic Visitor to homebound parishioners. Part I: Interactive Didactic: Theology, history, canon law, communal reflection, and Q&A. Part II: At the end, we will share Eucharist together. Suggested reading for the training sessions is “Burning Hearts” by Henri Nouwen and “The Cup of Salvation: A Manual for Eucharistic Ministers” by Beth Wickenberg Ely. Please email Deacon Matthew at matthew@trinitybuckingham.org if you plan on attending, or let your rector know. Also, please indicate if you want to be licensed as a Eucharistic Minister and/or Eucharistic Visitor, and if you are being licensed for the first time or renewing your license.